act 3 – Welcome to Spinksville! 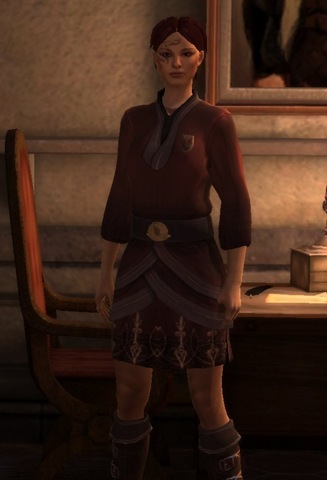 Hawke’s finery (which she wears around the manor in Acts 2 and 3) reminds me of a school uniform. Dragon Age 2 is, I think, going to be a game that provokes strong reactions. In my last post I briefly mentioned some of the shortcomings of the game (the repetitive areas, repetitive fights with waves of mooks teleporting/ rapelling in – funny how we don’t complain about repetitive fights in MMOs really…). 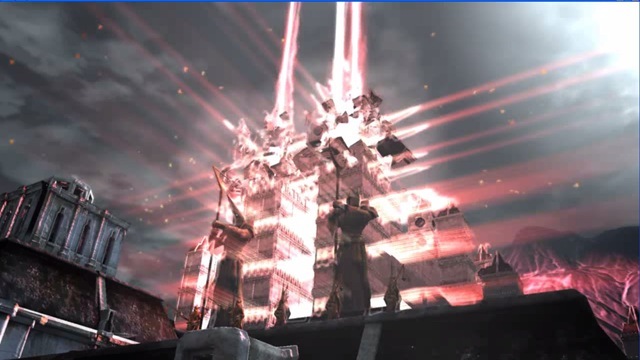 I’ve also mentioned briefly how DA2 incorporates more and more elements from good tabletop RPG games – the idea that your character and their companions have families, backgrounds, stories that will impinge into the main narrative and give your character (and companions) extra goals and motivations, and how I felt more of an emotional connection when playing this game. I thought they did make good use of Hawke’s family and family ties in the plot. Your sister/ brother and mother are intended to be emotional ties and plot elements (OK, there is a whiff of the disposable NPC here). I know that when I decided to support the mages in the end, it was largely because of my in game sister. I enjoyed this in DAO also, with my dwarf warden deciding the new ruler of Orzammar based on the fact he was nailing my sister (it always comes down to sisters with me 😉 ), but with this game they’ve taken it further and brought it more front and centre to the plot. The companions are some of the absolute high points of the gameplay, storytelling, and writing, even against Bioware’s reasonably high standard. I think every one of them is a winner. From reading other people’s thoughts (there is a thread on rpg.net about favourite companions) it looks as though every one of them expands into an interesting three dimensional character if you spend more time getting to know them. What I liked about the thread I linked to here is how passionately people defend their favourites. I still think Merill was an idiot, but it’s cool that some people want to argue that she was a genius. I enjoyed the idea of a game set in a single city. These single city campaigns have always been popular in tabletop RPGs (I’ll always remember The City of Seven Hills from our old and beloved D&D game) and have been touched on in RPGs before. Balder’s Gate was largely set in a city, as was Planescape. But setting the game in three acts over several years gives some geniune chances to see how the place and the characters change and grow. Seeing Aveline go from being a new recruit to captain of the guard was a good example, and well deserved. I did think Varric was awesome and loved how his unreliable narrative tied into the game play and the framing story. The quest where he confronts his brother and you get a section where he single handedly takes out waves and waves of trash mobs was hilarious. I also enjoyed the pacing of the story. Act 1 did feel slow with all of the side quests, but at the same time you really did get to know your way around the city and get introduced to some of the main characters who you would see in later acts. Act 2 was great and I loved the storyline with the Qunari, it was interesting, well played out, and Hawke did get to be a genuine champion. And then Act 3 was very pacey indeed but that worked for me since by that point I was quite keen to get to the end and not get distracted by side quests. I also think DA2 marks a change in how Bioware write their lead characters. Although there is still the power fantasy element – you are the hero, it’s never been easier to romance the love interest of choice – Hawke in this game is equally pulled and pushed by other plot elements in the background. And to my mind, the game is all the better for it. It’s about you, but not entirely about you. Sometimes you get swept along by forces larger than yourself. I’m not sure I envy Bioware trying to design love interests that will appeal to any player, it’s pretty much an impossible task. I did generally like the LIs better in this game than in DAO, but fans of Alistair will probably be disappointed in Anders and Fenris. Having said that, it was nice to see a few familiar faces making a brief reappearance towards the end of the game. And here’s a fun thread from the Bioware forums in which people discuss which they think the best line in the game was. My Hawke was a female 2 handed warrior. The 2 handed trees are super for smashing through waves of bandits et al really quickly. I think if I did it again I’d pay more attention to abilities that improve stamina regen though. I’m not sure how I feel about her voice, she was a bit of a posh girl and to me she always sounded awkward when she was being sarcastic/ witty. I played my Hawke as being fairly feisty/ sarcastic in the first two acts and more assertive in Act 3. I suspect that the conversational choices are both more subtle and more key to how people respond than is immediately obvious. My go-to party was Aveline, Varric and Anders, although I did spend more of Act 2 with Isabella in group than Varric because I liked her dialogues with Aveline. Bethany did not come on the deep roads expedition with me (I was persuaded by my in game mother’s pleas) and ended up being taken to the Circle. From subsequent letters, she seemed to quite enjoy it there but was around to fight by my side at the end. Hurrah! Astoundingly, all of the companions except for Sebastian ended up fighting by my side for the last fight. Fenris left when I sided with the mages, but came back when I asked him to. This surprised me because I hadn’t really spent much time with him. Maybe I was more charming than I thought. In Act 2, Isabella left but returned in the nick of time with her artefact when I was talking to the Qunari. I duelled and beat the Arishok in single combat, and that was a tough fight even on easy mode. I had Anders as my love interest. I do think he was a cool character, I liked how he was introduced at his clinic (you got the sense that he did have a genuine interest in helping people) and he did a great job of stopping blood mages from killing me and helping to identify people who were possessed in the first couple of acts. I also have a soft spot for blondes 😛 Yes, he went off the rails towards the end, and I was sucked in to hoping I could try to keep him (and everyone else) safe. I kept him in my party though, partly because by that time I just wanted to protect him from himself and partly because I needed him to help deal with the current crisis. I don’t think the relationship would have really lasted so I was amused when Varric said in the narrative that everyone left Hawke except for Isabella at the end. It may have been a bug (probably the love interest was supposed to stay) but I thought it was very plausible since she was pretty much my best friend. Incidentally I’m pretty sure Anders didn’t use magic to blow up the chantry but alchemy instead. Let’s face it, if he’d had access to that sort of magic, templars would have been blown up a lot sooner than that. As far as the Circle and Templars go, I tend to entirely blame the first enchanter for all the blood mages in Kirkwall. It was his job to train his mages better than that. If everything hadn’t completely gone to hell, I would have tried to get in a decent mage to head up the circle, but the templar/ circle relationship wasn’t really a good solution anyway. I still sided with the mages though since Meredith was clearly someone who had to go. So, finished Dragon Age 2, and thoroughly enjoyed the game. For all its faults (repetitive areas, long boss fights, waves of adds in just about every fight), it’s a style of game and writing that I find really compelling. I’ll write more thoughts on the game when I’ve had time to think it over. I still can’t decide if I liked it more than Dragon Age Origins. It probably was more emotionally involving though for me. Nice chantry you have there …. shame if anything …. happened to it!